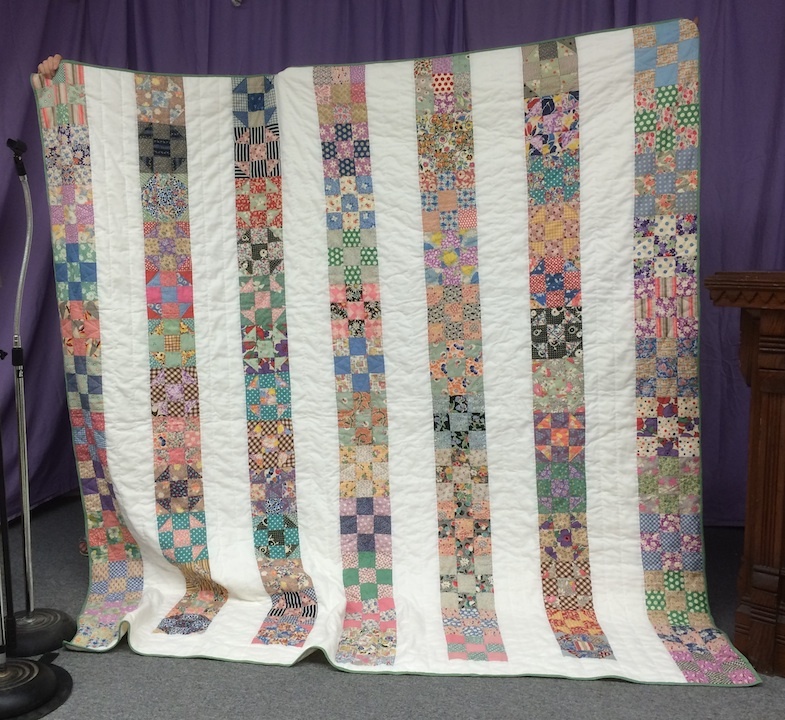 From found strips in a museum closet, Brenda Morgan has crafted this year's quilt for the Log Cabin Days Festival Quilt Raffle. What we know for sure: most of the fabrics are dated from the 1920's and 1930's with a few from the Civil War era; each nine patch block was sewn by an individual and combined into single strips; the strips were discovered in one of the Museum's closets. Taking two months to assemble, Brenda added off-white strips to create a double bed sized quilt-78 x 84. Thank you, Brenda! Tickets for the raffle are available here. Tickets are 1 for $1, 6 for $5. You may purchase tickets online now in packets of six using the link below. If you choose (1) quantity, six tickets will go into the jar with your name and contact information, (2) quantity is 12 tickets, and so on. As Log Cabin Days Festival draws near, tickets will be available to purchase at select locations on the Indianola square. You may purchase them now at the Museum on Thursdays or Saturdays.